Build theme (if it has one, not obligatory): Focused, sustained use of of an amped Death Shroud. Build Type: Efficient solo build, but very little group support. Build Link: Right here, boss. 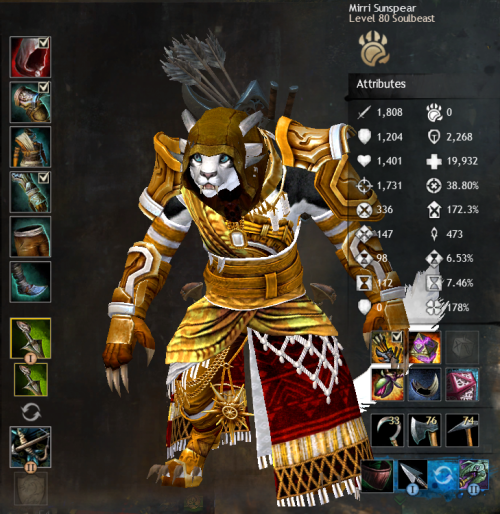 Build details: Named for the original Guild Wars Dervish skill, the Avatar of Grenth build is designed for sustained use of the Reaper's Shroud build, which is traited for enhanced damage dealing with might stacking, high crit, over 200% ferocity, and uses Chill to build sustain and life force. This is a much simpler build than my earlier post, with a great deal more damage, solid survivability, and a pretty neat feel in the way the traits interact. I also like the weapon and utility choices, which focus on drawing enemies in and affecting them en masse. This is actually similar in a whole lot of ways to the Chilling Death Build posted by Hystery (when I peeked at it, we were using the exact same weapons types, utilities, and Elite even! ), but while that build focuses on improving the duration and damage of its chills, this one uses chills as a means to acquire buffs to proc off Blighter's Boon rather than as a damage source. The Traits which make this build work are Reaper (of course), Spite, and Soul Reaping. Reaper makes the build work. It gives some of this build's most important traits. Shroud Knight - You can equip greatswords and use reaper shouts. Death shroud is replaced with reaper's shroud, which has more melee oriented skills. This gives you the Reaper Shroud and one of the build's Weapons. And two of its skills. KIND OF important. Augury of Death - Your shouts recharge faster for each foe they hit. While other choices are REALLY nice for chilled enemies, the chill in this build tends to be so short in duration that it makes more sense to go for shout recharge rather than a 2.5 second chill on luck. Reapers always perform best when surrounded by enemies, and this trait is no exception. Shouts receive a 7% recharge reduction for each target they hit, up to the maximum reaper shout limit of 5. Shivers of Dread - Whenever you inflict fear, you also chill. Chilling Force - Striking a chilled foe grants might and life force. This build has a good deal of chill in it for a reason, and this is half of that reason. Might is good. Cold Shoulder - Chill lasts longer, and chilled foes deal less damage to you. Blighter's Boon - Gain life force when you gain a boon. If you are in reaper's shroud, gain health instead. This is the other reason for having chill. Together, these two traits have the potential to generate a lot of life force, which can be used to rapidly build up your Shroud and, when IN Shroud, used to heal yourself. It's a very simple mechanic, but it has an interesting feel to it that I enjoy. Next on the list is Spite, which primarily deals in direct damage. Reaper's Might - Shroud skill 1 grants might. Yep. First Minor trait in the tree and you get a 15 second duration might every time you use the Shroud Skill you'll be using the most. This will proc off Blighter's Boon and heal you whilst in Shroud as well as build up higher damage. It's purdy nice. Spiteful Renewal - Consume conditions to gain health when you strike a foe below the 25% health threshold. 5 second recharge. Basically I had to pick one of three good traits that don't have a whole lot of bearing on the build, and so I picked this one because shut up. It's nice. Nicer for Decimate Defenses builds than this one, but still nice. Chill of Death - Cast Spinal Shivers on a foe when attacking them while their health is below the threshold. Nice for proccing Chilling Force, which triggers Blighter's Boon. Siphoned Power - Gain might when you strike a foe below the health threshold. 1 second recharge. Get enemies down low enough and you get 2 might stacks every time you hit the 1 key in Reaper Shroud, which proc Blighter's Boon, and 1 stack out of Shroud. Mwahahahahaha. Close to Death - Increases damage by 20% to enemies below the 50% health threshold. Hit everything harder when it's below half health. What's not to like? Soul Reaping is a trait line with a lot of options for Death Shroud and Life Force. Gluttony - Increases life force gain from skills. Speed of Shadows - Increases movement speed while in shroud. Reduces recharge on shroud. Run faster when you're in Shroud, and you're gonna be the in Shroud a lot, and this lets you go into Shroud faster. Last Gasp - Gain Spectral Armor when your health falls below the threshold. 50 second recharge. Protection and added when your HP goes below 50% on a minor trait. S'very nice, ain't it? Vital Persistence - Life force drains slower while in shroud. Shroud skills recharge faster. Stay in Shroud longer. This is nice for a Shroud build, yes? Death Perception - Increases critical-hit chance while in shroud. Go into Shroud and instantly get an added 50% Crit chance. Why would you NOT take this on a build based on Shroud use for DPS? Gear is Valkyrie with force sigils and strength sigils. I set the gear for exotics, and the extra pieces on the accessories were zerker for added crit%. Armor uses Runes of the Pack for the added buffs, which trigger Blighter's Boon, as well as what can probably be calculated at something like a 25% Fury uptime that can temporarily bump the build up to around 80% crit. The weapons are Staff and Greatsword for the moment, primarily because they make the strongest combination of weapons which can inflict chill. With the traits in this build, Staff 3 and 5 both inflict chill, along with Greatsword's last autoattack and its skill 5. Reaper's Shroud also gives Chilling on hit with its skills 3 and 5. Consume Conditions - Feast on your conditions, gaining health for each one consumed. You become vulnerable. 30 second recharge. Still probably the best single heal Necros have. It doubles as condition cleansing also. A possible alternative is "Your Soul is Mine!" given its much lower recharge and life force generation, but I thought this build could use some added condi cleanse because I'm paranoid about Conditions. "Suffer!" - Damage foes around you and chill them. Transfer a condition to each foe you strike. 30 second recharge. A Shout skill with recharge affected by the Augury of Death trait. The chill duration is short, but it's enough to be useful for Blighter's Boon/Chilling Force to be effected, particularly when paired with, I dunno, the very next skill on the list? "You are all weaklings!" - Damage foes around you inflicting Weakness on them and giving you boons. Gain additional might per foe struck. 30 second recharge. Yeah this skill grants 5 might stacks standard and 3 more per enemy it hits to a max of 5 targets. Using this right after "Suffer!" will mean everything around you will already be chilled, which will add another might stack AND life force. It's kind of a nice combo, right? Spectral Grasp - Pull your foe to you, chill them, and gain life force. 30 second recharge. Scorpion someone right into your melee range, chill them, and give yourself 16% life force every 30 seconds? Yeah that sounds nice. ELITE: "Chilled to the bone!" - Freeze all enemies around. Gain boons for each foe you freeze. Chill all of the things, or at least chill 5 of the things, for about 7 seconds, which is plenty of time to turn into Reaper form and get off several good whacks to drive up your HP bar and stack copious amounts of might. The build is fairly easy. Gather a high concentration of enemies, chill them, slap them around until you have life force, Shroud, go nuts and restore your health bar, come out of Shroud, build up life force rapidly, and repeat. You'll passively heal in Shroud, where your life force takes the damage in lieu of your HP bar. I like the playstyle because it's both very simple and has an interesting dynamic between normal form and Shroud form. They empower one another, and they're two very different playstyles that feed off of one another in heavy combat. Normal form has heavy access to chill for building up life force and might, certainly, but its damage is slow. It also has useful enemy pulling skills in Greatsword 5 and Spectral Grasp. Alone, it can kill things and has appreciable survival with its skills and the Vitality from the Valkyrie gear, but it isn't going to win awards. When you've build up a large pile of enemies, though, and hit Shroud, that's when the real fun goes into play. Big, heavy, fast AoE hits which do double damage on crit and a high crit percentage to add along for the ride. You'll also do a lot for restoring the damage your human form had sustained while building up even MORE might stacks, and when mobs dip under 50% health, you'll hit them even harder before dashing into the next pile and scything like mad until your lose Life Force and revert to normal, which will rapidly chill, build might, and feed the Reaper for another change. And now you have my character Dominic's IC build, the Avatar of Grenth. And that is the build. Build theme (if it has one, not obligatory): Centaur-Oriented Tank/Healer Revenant. Build Type: Original. This build is pretty good at what it does, but what it does also won't put out the DPS numbers and speed people like to see. Build details: This is a blatantly concept-driven build for my Revenant character, Seignis, which revolves around using the Centaur Legend in order to have a mobile 'base' area around which to camp and receive a steady influx of healing from Ventari's tablet as well as the orbs dropped by the Tablet's elite. While this isn't going to be a build which wins awards for instantly healing everything around you, running the fastest, or killing the swiftest, it IS crazy-durable. Staff: Your first and primary weapon, the staff possesses moderate (not heavy) melee attacking power, minor healing/regen/swiftness from the orbs it drops from its autoattack, a 2 second block, a heal/cleanse, and a bum rush charge to knockback and disrupt enemies. In As a melee-focused character, you WILL be wearing this thing out. Paired to the Centaur Legend, your durability via steady healing will keep you up and alive through most anything you could expect. When using Dwarf, the added damage and durability help you clear a room a little faster, as well as give added durability. Assassin will turn you into a blur of little healing dots and broken bodies for a few seconds, as well as grace you with some added mobility. Hammer: A Revenant's only ranged weapon, the hammer provides strong options for taking enemies out at a distance, and the further away you are, the more damage you'll do. It also provides a projectile reflect skill. The hammer is also blessed with a rather nice amount of AoE potential. Paired with Centaur, you are highly protected from ranged projectiles thanks to the hammer reflect AND the powerful tablet reflect, and most anything unblockable can be healed away within a few seconds. Paired with Dwarf, you have added protection from the vengeful hammers as well as mitigation from both Inspiring Reinforcement and forced engagement when enemies get into midrange. The Gear is all Cleric's, as are the accessories. Runes of the Pack give an added fury source. Sigils of force are on both weapons to help give damage a small bump, but while the Hammer has a sigil of accuracy to help it along for Crits, the Staff has a sigil of Water for small added healing in melee when needed. Being a build based upon essentially filling a Paladin-like role, traits were chosen based upon healing, defense, and enough offense to keep sane. The specs used are Salvation, Retribution, and Invocation. Since I'm sick of doing it like before where I outline everything, I'll just tell you how they work together, kay? Defense/Healing: With Nourishing Roots, Tranquil Benediction, and Selfless Amplification, along with the minors from Salvation, your healing output is increased and you gain two sources of Regen (From the orbs dropped by the staff as well as pulsing from Ventari's tablet). Close Quarters and Determined Resolution from Retribution reduce damage by up to 20% against ranged attacks and 10% against melee. Empty Vessel makes Legend Swapping into a stun break, and Dwarven Battle training both halves effectiveness of Weakness on you while giving you a chance to weaken enemies on hit. Pretty beefy. Offense: Invocation is tuned specifically to throw out as much fury as possible, as well as make Fury worth double the crit chance. That piddly 17% chance to crit in the build has immediately become 57% and close to permanent. Reflexive Summon from Retribution adds damage now and again with a giant hammer to slam down on enemies. Open in Dwarf and then toggle into Centaur after the first blows are struck (for fury), then drop Ventari's tablet right on top of your enemy (if in melee) and open up with the staff. This placement makes it easier to orbit the enemy and gather dropped healing orbs. As more enemies rush in and you have to move about the field, shift the position of the tablet to your next target and continue. When you dip to around 85% HP toggle the tablet healing pulses in order to keep up. If stunned or when energy runs out, swap to Dwarf and toggle on Vengeful hammers, then spam staff attacks and continue picking up orbs. Use dwarf heal as needed. When out of energy, swap back to Ventari. When ranged, swap to hammer and lay on the pain while keeping the table next to you as your little healing blankie. Reflect projectile first with your hammer reflect skill, Field of the Mists, and then the Tablet barrier, Protective Solace. Your traits ensure diminished damage from whatever does happen to get through your shields. That's the build! Simple in theory, kind of complex in execution, but I like it for my 'Vari Rev. Build theme: You're basically along for Quickness bursts and Perma-Alacrity. That's about it. Build Link: Link is Here... or is it?! Shield #4 (Echo of Memory) while running at the enemy. Auto-Attack and use Sword #5 and Wells off Cooldown until F5, Well of Recall and Mimic all are off Cooldown. Auto-Attack and use Sword #5 and Wells off Cooldown until F5, Well of Recall, Mimic and Time Warp all are off Cooldown, then return to step 5. Use Blurred Frenzy over Dodges to keep on the Offense, and always summon new Swordsmen to keep up with Chronophantasma, so that shattering them will always summon new ones. This also makes sure they're always at full Health. Use your Heal (Mantra of Recovery) off cooldown to keep stacks of Mantra Might up. For Armor, use High Prec gear such as Assassin or Captain for Armor and Weapons, with Zerker or Knight Trinkets. Scholar runes are useful as you'll spam your heal to hopefully keep over 90% HP at all times, having a Druid along makes this a cakewalk. Use Focus over Sword Off-hand in Projectile-heavy fights. Gear is optimized for survivability and hybrid damage. Designed to inflict as many stacks of burning on an opponent as a necromancer can solo. All said and done, gear can be swapped out as user sees fit--probably to something with more condi duration and different runes? I went for maximum burning uptime through runes of Balthazar which give +45% burning duration, and as such only needed Viper weapons, Smoldering Sigils, and Food/Utility Buffs to reach the Burning cap. This burning can be applied anywhere as it triggers off of Reaper's Shroud 1, so even your underwater weapons need Smoldering sigils. I chose +chill duration on every other slot except the one on the spear, because there's no chill on spear. The skills I included are fairly standard for Power damage, but can be freely swapped out for whatever you see fit. Same with the weapons, just change the axe trait if you use something else. Tl;DR: As this is mostly a shroud build you can really use any weapons with good life-force generation and whatever skills you desire. PVP amulet should be Vipers. Go for Condition Damage > Power > Precision > Vitality in terms of gear stats when making your setup--the ascended gear presented is "optimal" but is also tedious to get. Rotation: Generate maximum life force, Shroud 1 until target is sufficiently kentucky fried. Anyways, sorry if this counts as a Thread Necro. Irony dictates that it would be someone posting a Necromancer build though. I think it's time to add another Engineer build to this table and what better than the very build that my own Torchclaw Splinterfire uses. Build details: This build is a selfish might stacker. When using the Flamethrower, which is the main focal point, and using the elixirs off CD, you will have 25 Might, which will give you another 750 Power and Condition Damage. Because of this might you do not need to use Berserker stats, that is just my personal preference. You will, however, need high Power to use this, since that is the goal with which it was designed. If you don't run high precision, consider swapping out the Superior Sigil of Air for a Superior Sigil of Accuracy. The Flamethrower is the main means of damage output, with the hammer and toolbelt skills mixed in. The hammer, especially Rocket Charge is your bread and butter for everything not directly related to damage. The flamethrower is the easy part. The part that requires some training and skill, is everything not regarding damage output and as mentioned, this is where Rocket Charge enters the picture. It is your main means of combo finish. Use it in the field from Thunderclap and you will break any breakbar that doesn't belong to a Champion or higher. To heal, which you will need to do, you have a couple of options. Option 1 is the Medic Gyro on its own. It's a decent heal, but not the main reason I run with it. Option 2 is Elixir Shell from the Mortar Kit. This skill can also be used to stack might and clear conditions, since it's an elixir. It produces a water combo field which can be finished in for healing. Option 3 is Reconstruction Field, the Medic Gyro Toolbelt skill. This is a mobile water field centred on you. Combine this with Rocket Charge and you get three healing leap finishers. Apart from Rocket Charge, you also have Detonate Flame Blast from the Flamethrower and the Orbital Strike, which can be used in fields for Area -field type. These two Blast finishers are everything that Rocket Charge is not. Use it for mediocre team-support by Blasting Napalm for Area Might, one of your water fields for Area Healing, and the lightning field from Thunderclap for Area Swiftness. This way you have permanent swiftness uptime, although it requires timing to land both blasts while running, due to the cast-times and after-cast. Build theme (if it has one, not obligatory): "Running with the wind, Trifidan leapt into a willow by the edge of the lake, not pausing for a single moment before he swung himself further into the canopy just before his pursuit rounded the bend of the hillside. Staying calm he drew his bow, taking aim with nary a sound. As his pursuer closed on the bank of the lake, mere metres from the willow that had become Trifidan's sanctuary, the wind set the leaves rustling, obscuring the sound of arrow and bowstring being pulled taut. With a last caress of the leafy feathers, the arrow was sent flying, the eyes of the pursuer snapping to the willow before the arrow struck true, embedding itself in its target with a hollow thud. Trifidan sheathed his dagger and hauled the fine pelt over his shoulder. He adjusted his quiver, bow, and sword, looking at the setting sun. He'd been away from his campsite longer than he'd intended, but he doubted that his 8-legged friends would care much about that. Grabbing the silken rope he'd secured his dangerous kill with, he set off." Build details: Stab, slash, and shoot. Pets are your choice. Unblockable poison attacks: Stack as much poison as you can in multiple ways! Build Type: Some original inspiration, Meta Battle and Boots' Bad Builds . Build details: Poison, poison, poison, and with a helping of lifestealing! Combine this with Jungle Spider or Lashtail Devourer as the pets and there's lots of things to help with that. Light on your Feet: Your damage and condition duration are increased after dodging. Short bow skills pierce and gain recharge reduction, and their attacks from behind or flanking are improved. Last for Danger: Gain increased vitality. You and your pet gain expertise based on vitality. Refined Toxins: While you are above the health threshold, your strikes inflict poison. While your pet’s health is above the health threshold, its strikes inflict poison. Poison Master: After swapping pets, your pet’s first attack will inflict poison; your poison damage is increased. Unstoppable Union: Entering bestrode breaks stun and causes your attacks to be temporarily unblock able. Predator’s Cunning: When you apply poison to a foe, steal some health from them. Oppressive Superiority: Deal increased damage to foes who have less health than you. Conditions you apply to foes with less health than you last longer. Bear Stance: Heal yourself and your pet. Lose conditions while in this stance, healing for each condition lost. Vulture Stance: While in this stance, striking a foe grants you might if they are above the health threshold and inflicts poison when they are below it. Signet of Renewal: Passive - You and your pet recover health. Active - Grant resistance to your pet; it pulls conditions from nearby allies to itself. Viper’s Next: Set a trap that pulses poison on foes when triggered. Entangle: Entangle foes around you with vines. Entangled foes bleed and are immobilized until the vines are destroyed. Swap out for PvE areas - Signal of the Hunt: Passive - Grants 25% increased movement speed to you and your pet. Active - You and your pet’s attacks become unblock able. Purely for movement speed. Marauders - Power, Precision, Vitality, Ferocity. 6) +20% poison duration; 50% chance when struck to summon a radiation field. Radiation Field is similar to the asuras skill, but instead of 15 seconds it is only 10 seconds and the range is less. One of the nice things with this build is that while you are attacking, you are always stealing health. This even works with the rune proc, Radiation Field. For 10 seconds as the field is active, each tick of damage is giving health back to you. Jungle spider as one pet also helps by having an immobilize (whereas Forest Spider does not). Why Lashtail Devourer over Whiptail Devourer? Because it matches with the poison. Lashtail Devourer deals a stack of poison with it's attack and cripples the target. Please don't actually bring this into a raid.